I am super-proud of this new song I have been working on. I just posted it to soundcloud with some beautiful cello goodness contributed by the Celloist. I will definitely be playing it live at my show this Saturday at Actual Cafe in the East Bay and next Saturday at the Songwriter Saturdays at the Exit Theater in San Francisco. For full details see my shows page. Hope you enjoy the tune. Check out the video below of my new song: I Don't Believe In Love. Don't get too worried, I have not lost all faith in the Universe, I was just inspired by the way real love doesn't often present itself the way it's almost always portrayed in mainstream movies and media. This song will definitely be included in my set at the upcoming Lost Church show which is going to be Ah-MAZE-ing! It's my first show with a band and I am really excited about it because things are sounding really good! Full details on the Lost Church gig can be found on my Shows Page. See you there! In honor of Easter's recent passing I thought I would share this new video of my song Jesus and Judas. This video was taken at the PLACE Songwriter's Showcase on March 30th. As you will see and hear this was a wonderful show, and the folks at PLACE for Sustainable Living are up to some really awesome stuff. You should check out this new Songwriter's Showcase if you get a chance, it's on the last Saturday of every month. Tonight is history in the making. A new Songwriter's Showcase is beginning at the PLACE for Sustainable Living. Come check out this beautiful emerging venue with an outdoor fireplace and a great sound system. I will be opening for the wildly talented Essie Redbird and Heather Normandale! I'm going on at 8pm. Full details here. 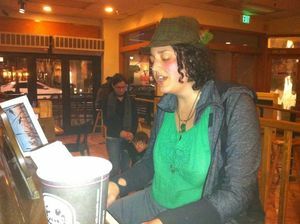 I performed in front of approximately 300 people at One Billion Rising on Valentine's Day. I shared a brand new song that I wrote specifically for the event and I received a standing ovation from the largest crowd I have ever played for! Hooray! Brighten up your Monday with some beautiful music! Bekah will be sharing a lot of new material in this intimate setting and will also be joined by cellist Ben Hamilton. 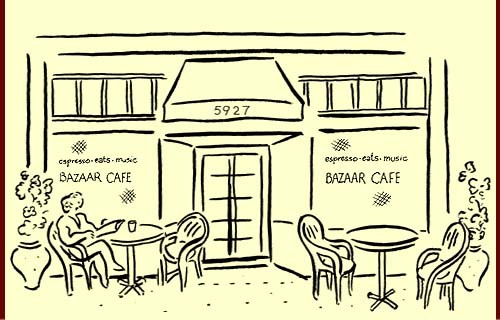 The Bazaar Cafe is the perfect listening room and offers all sorts of beverages and edibles to satisfy your cravings. Details on the shows page. Take a listen to this new song I finished recently. It's called Every Road You Take and I am pretty happy with it. it is just a live guerrilla recording from my iphone, so the quality is not the best, but I think you will still be able to enjoy it. Feel free to download and share as much as you like. Check out this documentary episode by Slim Critchlow on the Sunday Night Mic event that happens at St. Luke's Episcopal Church in San Francisco. Bekah's performance begins at 31:20. Check out this time lapse video from the Art Hop I played at with the very talented Ben Hamilton. Art by Alison Nowak. Hosted at the Temescal Art Center. Many thanks to Ben for creating the video. This is a great interview that I did with the MyHeartBeats.org Art Collective. Thanks so much to Anthony Yousko and Ben Hamilton for putting it together. Check out this short promo video for Piles of Stones-a collaboration between myself and a talented young cellist, Ben Hamilton. The shows last weekend went well-thanks to everyone who came out. We're planning to post more video soon. Stay tuned. My debut CD, Find Shelter Here is complete and available for your listening enjoyment. You can purchase it on iTunes or order a physical copy through CD Baby. You can also hear a preview on my music page. The show at Martuni's was phenomenal. Those of you who came out and were witness to this-thank you so much for celebrating with me! I will be posting more pictures and video soon so check back. Thanks to everyone who came out and celebrated with me. This was a lovely and intimate gathering and now a select few are already listening to Find Shelter Here. Don't forget about the official release party at Martuni's on July 22nd! Details are on the Shows page. The show at the Hotel Utah was vey nice. Great venue, awesome crowd filled with great people. Thanks to everybody who came out and listened. Check out myMusic page for a link to listen to all six songs. I recommend Beautiful Girls and Grace, both new songs that you probably haven't heard before, recorded for the first time that night. Corpus Christi: Playing with Redemption was greeted warmly by a large audience at the Castro Theater. This documentary explores the relationship between the christian right and the gay community, with an undeniable message of love. Bekah Barnett's song Light is featured prominently in the film. You can learn more here. The radio interview and gig in Santa Cruz went well. Thanks to everyone who tuned in to KSCO and/or came out to the Santa Cruz Coffee Roasting Company to listen live. You can see more pictures on the photos page.